Why has it escalated? Governor Cuomo got his surrogates out there, the people who were on the commission to say, hey, this commission was fine, the Governor, the Governor's people, they never bothered us, we were independent. And Preet Bharara, the US attorney, said, well isn’t this intriguing? Mr. Fitzpatrick originally not only expressed it orally but perhaps has expressed it through e-mails and said he wanted the Governor out of this, that it was independent. Now he's saying it's just all fine. As more details come out about the Governor’s involvement in the unfolding scandal, it will be more difficult for the networks – and particularly CNN – to ignore a major story about a high profile governor and potential 2016 presidential candidate. 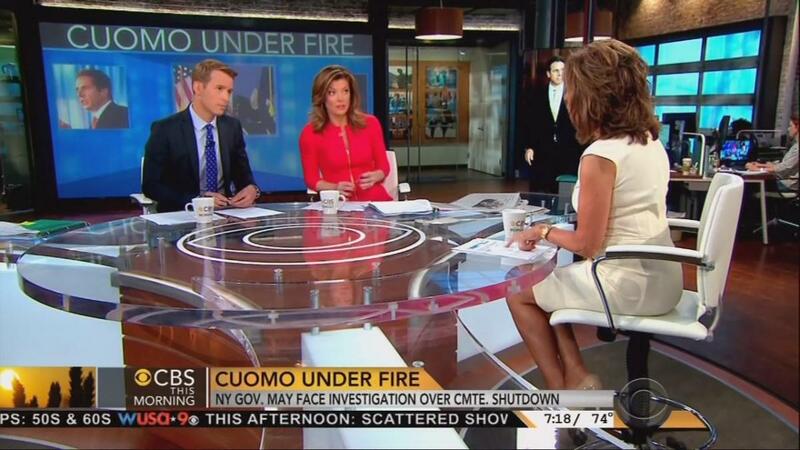 NORAH O’DONNELL, co-host: And in The New York Times this morning a criminal defense attorney said he's been hired by Governor Andrew Cuomo’s office. The US attorney in Manhattan reportedly warned Cuomo and his aides that he may pursue obstruction of justice or witness tampering charges. The dispute involves the so-called Moreland Commission the Governor created last year. BEN TRACY, guest host: Now, that 25-member panel was supposed to spend 18 months rooting out political corruption in New York State. But Cuomo shut down the commission in March, saying its work was done. The New York Times reported last week that Cuomo’s top aides repeatedly blocked anti-corruption investigators. Cuomo denies any wrongdoing. CBS News legal analyst Rikki Klieman is here this morning. So Rikki, we reached out to the Governor’s office, all the members of his commission. No one responded. Why is the US attorney involved here? RIKKI KLIEMAN: Well, the US Attorney originally became involved because of the abrupt end of this commission. So the US attorney, in the person of Preet Bharara, a very powerful US attorney says, well we're going to finish the commission's work, we're looking at corruption, which was perfectly permissible for him to do. But that's months ago. So now this has escalated. Why has it escalated? Governor Cuomo got his surrogates out there, the people who were on the commission to say, hey, this commission was fine, the Governor, the Governor's people, they never bothered us, we were independent. And Preet Bharara, the US attorney, said, well isn’t this intriguing? Suddenly we have this onslaught of the Governor's people saying that everything is fine, so he took the bull by the horns. O’DONNELL: So does that suggest criminal witness tampered? KLIEMAN: Well it certainly suggests the possibility of investigating criminal witness tampering as well as obstruction of justice. The US attorney's office says, hey, Governor and Governor’s staff, lay off my witnesses. And if you persist, even by telling them to go forward to say everything is just great, we're in this, we're looking at you, and we're not letting go. O’DONNELL: And The New York Times is reporting that the co-chair of this commission has changed his story. Privately he had expressed frustration about meddling from the Governor’s office in this investigation. RIKKI KLIEMAN: Yes, that is correct, at least as we understand it. That Mr. Fitzpatrick originally not only expressed it orally but perhaps has expressed it through e-mails and said he wanted the Governor out of this, that it was independent. Now he's saying it's just all fine. Preet Bharara doesn't like that.